Is anyone using BIN with VRBO/Homeaway successfully with Bookerville. If so how are you handling that? For anyone else reading this, and confused: BIN = "Book It Now". 2) Hook up with BookingPal, our new channel manager: Bookerville has partnered with BookingPal, a channel manager boasting rich integrations with dozens of listing sites including AirBnB, FlipKey, Booking.com, TripAdvisor, Roomorama, and many others. This will not only synchronize your availability calendars, but also provide much more data integration including property features/amenities, rates, taxes, photos, and more. They are also in talks with Homeaway so we believe that will be available soon too. More information: BookingPal Channel Management. We advertise predominately on VRBO, which will begin requiring Book It Now on all properties in 2016. How will this work with Bookerville as far as payments and integration? What is being said by industry insiders about this? I am interested also. I run 7 vrbo listings and Bookerville keeps me all organized. I enabled the BIN feature on the listings and it's not been smooth sailing thus far. Yes, with the help of Bookerville, we have grown to nearly 40 condos. We love Bookerville, but are afraid of how this will affect our processes. Hi Pam and bgwelborn: what issues are you experiencing now that you're using BIN? By the way: BIN does not necessarily mean instant online booking. Managers will have 24 hours to accept or decline each booking, and the default (after 24 hours) is that it is canceled. Please keep the conversation going: we learn the most from your feedback. Please see the following link to changes coming in 2016. What concerns us it the mention of HomeAway Payments as the credit card processor. I notice that they mention other payments will be allowed, such as check, PayPal, but no other card payment gateways. Also, I'm not sure how they will tack on their commission without funneling all payments through their system. While we don't know for certain what the future holds, I think it's fairly obvious that eventually they will require us to take all bookings through the website. There is no other way for them to collect a booking fee from the guest and they have made it well known that a booking fee is coming. If I don't take any bookings through the Home away dashboard, then I have no "conversions" and the resulting push down the rank of listings. I can still use Bookerville when I take a booking through the dashboard, I just add the booking and block the remaining payment reminders. I don't like having my payments processed through Home away. The fee is .5% higher and the dashboard is terrible for quotes, etc. There is no add on menu for guests to add services. I'm on their schedule for security deposit returns, etc. Those are the problems that I have with it. Understood. And I don't see much that we can do about that. Other than strongly recommending that you branch out and try other marketing avenues. HomeAway is not the only option. And you can explore other options simultaneously while leaving your HomeAway account in place. The future really looks like Channel Managers. It's where the airline and hotel industries went decades ago. And it eventually led to lower prices (lower commissions). What marketing avenues do you recommend? We are currently updating our website so that guest may book directly from our site. Have you ever heard of Matt Landau? He specializes in educating property managers on how to market their properties themselves. Learn more: Matt Landau. There are also other listing sites. Although HomeAway/VRBO is still the largest, AirBnB, Booking.com, FlipKey/TripAdvisor are all viable options. When using multiple channels (listing sites), the first frustration is sync'ing all the data, especially the availability calendars. Bookerville provides calendar sync (two-directional) using simple iCal feeds, but to truly get rich data integration with multiple listing sites, you'll want to use a Channel Manager. We are currently integrated with BookingPal, who has integrated with AirBnB, Booking.com, and FlipKey/TripAdvisor. We are also gearing up for Rentals United, who boasts integration with HomeAway/VRBO. Each of these is constantly working to increase their distribution to more channels (listing sites) as they become available for API integration. Agoda is getting larger and trying to make headway into the U.S., as is Roomorama and others. It appears that the vrbo bin requirement is in full swing. I no longer have a working Bookerville auto responder. 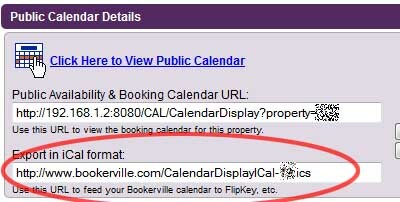 I will wait until tomorrow to see of my Bookerville calendar populates with the vrbo booking that just came in.